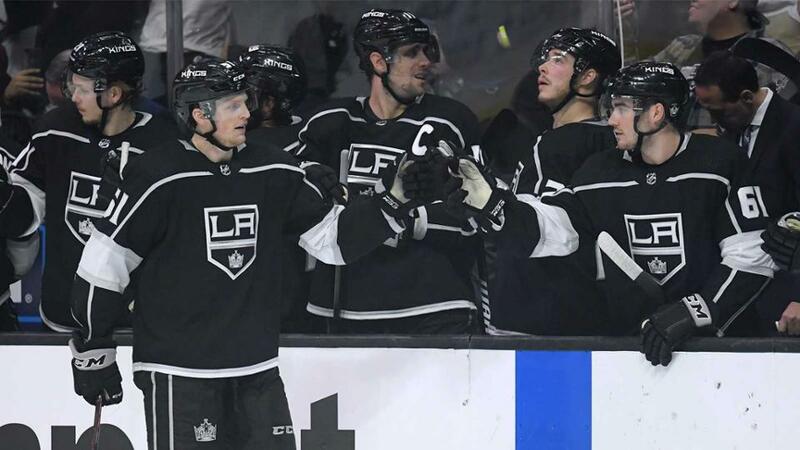 The Los Angeles Kings have recalled forwards Mike Amadio, Austin Wagner and defenseman Sean Walker from the Ontario Reign (AHL), Kings Vice President and General Manager Rob Blake announced on January 31, 2019. The 22-year-old Amadio (born May 13, 1996) is a 6-1, 204-pound native of Sault Ste. Marie, Ontario who has appeared in 28 games with the Kings this season, collecting four points (2-2=4) and four penalty minutes. Amadio, who made his Kings/NHL debut last season, has six goals and 12 points (6-6=12) in 65 career games with the Kings. In Ontario this season, the third-year pro has 11 points (2-9=11) and four penalty minutes in 14 games. The Kings selected Amadio in the third-round (90th overall) of the 2014 NHL Draft and he made his pro debut with the Reign during the 2016-17 season. The 21-year-old Wagner (born June 23, 1997) is a 6-1, 185-pound native of Calgary, Alberta who has appeared in 34 games during his rookie season with the Kings, collecting nine points (4-5=9) and eight penalty minutes. Wagner made his NHL debut on Oct. 5 vs. San Jose and scored his first career NHL goal on Nov. 21 vs. Colorado. Wagner appeared in two games with Ontario after being assigned there by the Kings on January 22. The second-year pro has collected three goals (3-0=3), a plus-3 rating and 16 penalty minutes in nine total AHL games this season. The Kings selected Wagner in the fourth-round (99th overall) of the 2015 NHL Draft. The 24-year-old Walker (born Nov. 13, 1994) is a 5-11, 196-pound native of Keswick, Ontario who has appeared in 19 games during his rookie season with the Kings. Walker tallied his first career NHL point (an assist) in his first career NHL game on Oct. 23 at Dallas, and his first career NHL goal at Colorado on Dec. 31. Walker has three points (1-2=3) and two penalty minutes with the Kings this season. Walker appeared in two games with Ontario after he was assigned there on January 22. The second-year pro – who also represented the Reign at the recently completed 2019 AHL All-Star Classic (Springfield, Massachusetts, January 27-28) – has collected 17 points (6-11=17), a plus-5 rating and 18 penalty minutes in 22 AHL games this season. The Kings signed Walker as an unrestricted free agent on July 3, 2018. The Kings return to action with a February 2, 2019 road game against the New York Islanders (4 p.m. PST), and that game against the Islanders will open a season-long six-game road trip for the team. The Kings-Islanders game will be broadcast on KCOP-TV 13 and on the LA Kings Audio Network (iHeartRadio).